Technology can be a double-edged sword when it comes to how advances in the field affect sleep habits and sleep health in general. For example: The advent of electricity and the ensuing widespread use of artificial light has resulted in many creature comforts for humans, but it has also resulted in more varied and often unhealthy sleep-wake cycles. However, there are also many tech-based products that are specifically designed to elevate the sleep experience; from accessories like electric blankets, to big ticket items like air beds offering adjustable firmness. Enter: Amanda Sleep. The company is a newcomer to the industry, but already it is making waves with its sleep technology-based offering—the Amanda smart mattress, with its proprietary design and accompanying biometrics-sensing sleep tracker. When it comes to the actual mattress design and construction, the information on Amanda Sleep’s official website is not so precise. It took us a few rounds of conversation with customer support representatives—more on that later—to verify that the Amanda smart mattress and the Amanda Rubiflex sleeping mattress are exactly the same, sans the sleep tracker bundled in with the former. 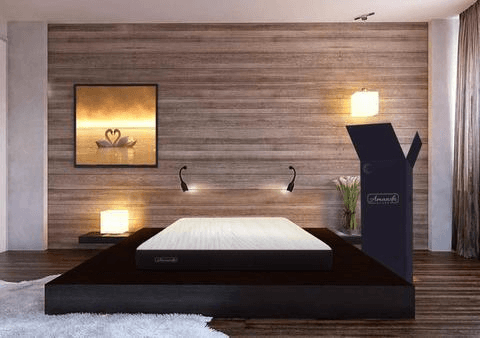 The Amanda Sleep mattress is composed of four layers—including a Rubiflex cocoon polyurethane-based foam layer—which stack up to a total of an above average thickness of 11 inches. All foams are CertiPUR-US approved; and the mattress cover has been given a Standard 100 Class 1 certification by Oeko-Tex, which means that it’s been deemed suitable for use by children and infants. The company’s vaunted sleep technology is actually powered by health monitor makers EarlySense. The one-inch top layer of foam is made of what Amanda Sleep calls “Pneumatic Visco-gel”; our best guess based on this description is that this is a gel-infused foam variant designed for good airflow. The company states that this layer is designed specifically for temperature regulation and comfort. The two-inch layer of Rubiflex foam sits immediately underneath the top. This is what sets apart the Amanda Sleep mattress from its competitors. One can argue, though, that most mattress startups today do have that one specific material that makes their product different; for example: Brooklyn Bedding‘s TitanFlex or Purple‘s hyper-elastic polymer. However, Rubiflex maker Huntsman has released a paper on the use of Rubiflex as a mattress foam. After checking out the data, we can understand why Amanda Sleep has made this material the cornerstone of their mattress design! The results show that Rubiflex provides great cradling support and pressure point relief, as well as heat and humidity dissipation. 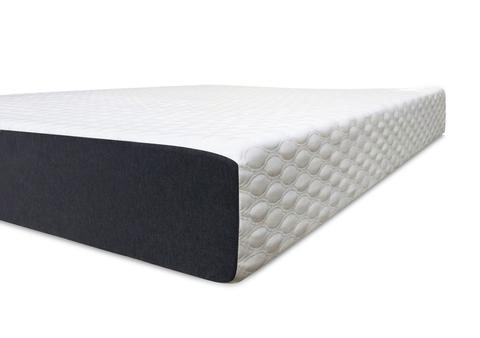 The penultimate layer is composed of two inches of support foam likely to serve as a transitional layer between the Rubiflex foam and the bottom of the mattress. Support foam’s high density and durability can make this layer important in keeping a sleeper’s body properly aligned on the bed, too. The final layer is a six-inch block of support foam that is the foundational base of the mattress itself. 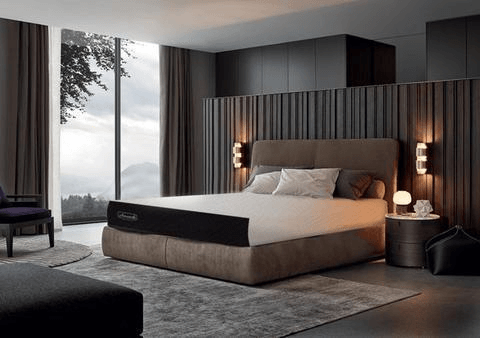 On top of further helping with pressure relief and body alignment, it’s also the part of the product that needs to hold up most against whatever solid surface the mattress will be laid over. There’s no specific data regarding how Amanda Sleep makes their mattresses fire resistant, but a quick question sent to customer support solved this mystery right away. They use a fire sock, although the fabric composition and treatment was not specified in their reply. Over this fire sock is a hand-sewn, quilted cover that’s about half an inch thick and made of bamboo fiber that is organic and free of harmful chemicals. Amanda Sleep claims that the cover is designed to be breathable, hygienic and anti-bed bug; on top of being wrinkle-free. Unlike many mattresses, Amanda Sleep states that while you can use a damp cloth for spot cleaning the surface, you can also hand wash the cover, and even place it in a dryer. However, they do also state on the official website that the “layer with the technology/sensor” is non-washable. Curious since the tech is not found anywhere in the mattress or even on the cover; unlike close competitor Eight‘s smart mattress, for instance. Now, let’s look at the sleep technology that’s specific to the Amanda smart mattress bundle. We encountered some difficulty when we did our research on this; as even Amanda Sleep’s official website does not have a single photo of the device itself, nor a precised and detailed explanation of how it works and what it does! However, persistence pays off, and we did eventually find out that the sensor that the Amanda smart mattress uses actually comes from EarlySense; and that it’s much more than simply a sleep tracker. It’s worth repeating at this point that you can purchase Amanda Sleep’s Rubiflex sleeping mattress for a much lower price point—if you’re not interested in the sleep technology slant of the Amanda smart mattress, that is. There is no way to purchase just the sensor from Amanda Sleep; although EarlySense does have an online store where you can find it listed. Amanda mattresses come in six standard US mattress sizes–twin, twin XL, full, queen, king and California king. There’s no listing of the weight of these mattresses, but they are thicker than average—11 inches compared to the usual mattress-in-a-box thickness standard of 10 inches—so it makes sense to expect them to be on the heavier side. Curiously, the mattresses also come in varying comfort levels—luxury firm, plush soft, and firm—which is an option not normally given by new e-commerce mattress startups that focus instead on a “one fits all” design. Amanda Sleep proudly notes that their mattresses can be used on many surfaces, including: adjustable support bases, box springs, foundations, platform beds, and slatted frames. However, there is no information on whether or not putting the mattress directly on the floor would void the warranty or affect the sensor or the structural integrity of the mattress itself; so it’s best not to try it. Slats may also prove to be cumbersome if they are too far apart to properly support the sensor—which is supposed to be placed in between the mattress and its base—so keep that in mind, too. Ordering the Amanda smart mattress online works the way expect: add it to your cart, enter your details, and wait for front door delivery. No frills here; unlike some other e-commerce mattress startups, there’s no option for white glove delivery. However, shipping and returns are free; and Amanda Sleep even provides customers a way to track their purchases online up until it’s at your doorstep. The mattress and sensor come with a manual, along with a cutter that can be used to unbox and unpack the products. This also works the way typical mattress-in-a-box products do: you slowly unroll the mattress onto your bed base, remove the packaging carefully, and wait for the mattress to expand and decompress. It should take just a few hours; and any noticeable off-gassing that may occur should dissipate in that time, too. Again, we noticed a lack of information provided on the official website when we got to this point. Most competitors specify a maximum amount of time a mattress can remain compressed in a box before it starts to sustain damage; we can find no similar disclaimer made by Amanda Sleep. This may mean that they are confident that compression won’t damage their product; but it could also be an oversight that hasn’t come to light yet because the company is so new. The sensor is easy to use and set up. No device you need to wear, no additional cover you need to slip over the mattress. Just plug it into a power outlet, slip it under your mattress, and download its mobile app to connect the sensor to your smartphone! Not only will it track your sleep habits and sleep quality, but it will also give you constant and consistent data on heart rate, breathing, other vital signs, and stress level indicators. For more information, we recommend checking out EarlySense’s FAQ. Amanda mattresses can support about 600 pounds, although it’s not specified whether this capacity is per sleeper or per mattress. Either way, it’s a great offering; even if we assume that 600 pounds means a maximum of 300 pounds per side of a two-sleeper mattress, that’s already better than the 250 pount weight limit of close competitor and fellow smart mattress maker Eight. The advised mattress rotation schedule for Amanda mattresses is the same as Eight’s, though: every three months, instead of the average industry recommendation of every six. Like all hybrid foam mattresses we’ve reviewed, Amanda’s mattresses should not be flipped. This is hardly an issue that is worth taking into consideration before trying out the Amanda smart mattress or the Rubiflex sleeping mattress, and we are confident in saying this because of two facts: Amanda mattresses come in three different comfort levels, so you can choose exactly the kind of feel you want. On top of that, if you find your choice was not quite what you expected, there’s a risk-free trial period during which you can return the product for free. However, it must be said that an above average thickness and a generous weight capacity does make an Amanda mattress more likely to be comfortable for older or heavier sleepers. On its own, Amanda Sleep has a lot to prove. They’re very new to the mattress industry, with less than transparent beginnings; at least compared to some others—like Brooklyn Bedding or GhostBed, for example—that include elaborate origin stories as part of their company information. With Amanda Sleep, all that’s made public is that the company was formed by three entrepreneurs with tons of experience and a shared passion for finding ways to reduce sleep problems. In a way, this is admirable, because it feels like Amanda Sleep wants their mattresses to shine; regardless of the backstory that may be behind its development. However, two things that are crucial to the Amanda smart mattress—the Rubiflex foam and the sleep tracking sensor—actually have great track records. In fact, we’ve already linked to both Rubiflex maker Huntsman and the sensor maker EarlySense elsewhere in this review. It may have taken much more research, but it seems that some of the information that we found lacking in Amanda Sleep’s official website can be supplied by simply looking up Rubiflex and EarlySense directly. Coupled with a generous trial period and an above average warranty period, this information about Rubiflex and EarlySense is enough to make up for the fact that Amanda is not backed by years of proven reliability and excellence. One more thing: We appreciate the fact that Amanda Sleep has a live chat option! Not many online mattress direct sellers do, and it’s especially convenient for a new company to have this in place, as customers will have many questions. This is another huge point in Amanda Sleep’s favor, though it is balanced out by something that we really didn’t like: imprecise and sometimes downright conflicting information on the official website. Never mind the details that we didn’t find at all; such as the fire resistance measures, which we had to verify through their very attentive and friendly customer support. What’s alarming is how difficult it was to figure out that the Amanda smart mattress is just the Rubiflex sleeping mattress with an added sensor. Even with customer support helping us out, it took a while to verify the components of an Amanda mattress. The products themselves are good! There is no need for such vague language and a lackluster FAQ section. There are multiple instances where the 25-year warranty is mentioned and the words “details are available here” follow, but there’s no hyperlink visible. While it’s true that a printed warranty is likely included in the purchase, it’s very unusual for any e-commerce entity offering a warranty to not have an easily found version of it online. Outside of this inconvenience, there is a one-year trial period that matches the previously industry-leading 365-night sleep trial offered by Nectar. Unlike many other similar companies, the trial period given starts on the day of product arrival—not the day it ships out. Amanda Sleep states that returns are free as long as it’s initiated within a year of receiving the mattress and sensor. Worth noting that the 365-night sleep trial and its attached return policy is only valid for purchases made through the official website; also, you can return just the sensor or just the mattress. A queen-sized Amanda smart mattress is available for $1,100 on the official website’s online store. A Rubiflex sleeping mattress on a similar size is $900. The price is comparable to typical mattress-in-a-box models available online. Amanda Sleep also offers financing options—payment plans like flexible repayment or pay after delivery—in the form of a partnership with Klarna. What follows isn’t directly related to the subject at hand, but we’ll include it anyway. With the price difference between the Amanda smart mattress and the Rubiflex sleeping mattress, some of you may be wondering if it would be less expensive to simply buy the Rubiflex sleeping mattress from Amanda Sleep and a sensor from EarlySense separately. Some may even be wondering if it would be even cheaper to just buy a sensor and use it with their existing mattress. We’ll be clear about this: Yes, it would be cheaper, but it wouldn’t provide great value in the long run. A quick look at EarlySense’s online store reveals that their trial period is about two months—just one-sixth the length of time you’d get to fully test a similar product if you opt for the Amanda smart mattress instead. Amanda Sleep is off to a positive start, but the official website needs work—great customer support can only go so far without a good foundation. We’re hopeful that as the company grows, its FAQ section will as well. As for whether or not we recommend it: Yes, but cautiously. The 365-night trial eases 99% of our worries; the remaining 1% is due to the newness of the company. Understandably, there are no hard statistics on its reliability and business practices; but their choice of great entities to work with and the responsiveness of their customer support are good initial signs. Our advice, should you be interested in investing in an Amanda smart mattress: Read up on not just Amanda Sleep, but on Rubiflex and EarlySense, as well; establish communication lines with Amanda Sleep customer support early on; and keep an open mind. Most new mattresses need a break-in period, and most new technologies come with a learning curve.